" The most powerful force in the world"
that is how the all time genius, Albert Einstein thought about the compounding interest. He even called it as the 8th wonder of the world. In simple term, compounding interest is as you start earning interest on your investment and the interest you gained is added back to your investment. As time goes by, you start earning more interest on your interest! Everyone knows this, understand this but not many people fully understand the impact of compounding interest in the long run. The 2 important elements in compounding interest is the interest rate and the time. Let's first compare the impact of interest rate on our initial investment capital. This is easy. Of course, the higher the interest rate, the higher return you get from your investment capital. Next, let's us apply the same interest rate with period of 10 years. By using Excel, you can easily get a table like this by multiplying 1.1, 1.15 and 1.20 from previous column. 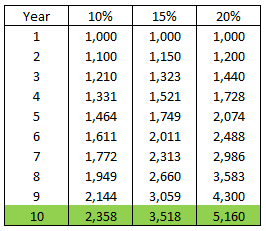 You get around 5k at the end of 10th year, it's 5 times your initial investment capital with the annaul return rate of 20% compare with around 2k with return rate of 10%. It's almost 3k more if you able to get addition 10% annual return from your investment from 10% to 20% annual return. You get 100% return from your investment capital at 9th, 6th and 5th year with annual return rate of 10%, 15% and 20% respectively. This is common sense as you reach your target (100% return) faster with higher annual return. Okay. It's always easier said than done. Who doesn't want to get rich faster. Higher return of course comes with higher risk. So far I only show you positive return which is profit. What if the return is negative or lost, you definitely will get your blood being sucked out faster and become a zombie. I, like a typical employee or worker/labour in other term, every penny earned is my hard earned penny which scarificied lots of time and sweat. But the good thing is I'm still young. I'm able to absorb failure and start over again. Learn from mistake I did on investment, I know I'm better than yesterday.